FILM LOCATIONS ARE WANTED ALL OVER THE PLANET – MAKE MONEY & HAVE FUN ON MOVIE SETS. Everyday we receive inquiries from production seeking filming location rentals. The need for homes, businesses, acreage, abandoned and unique location rentals are requested worldwide. 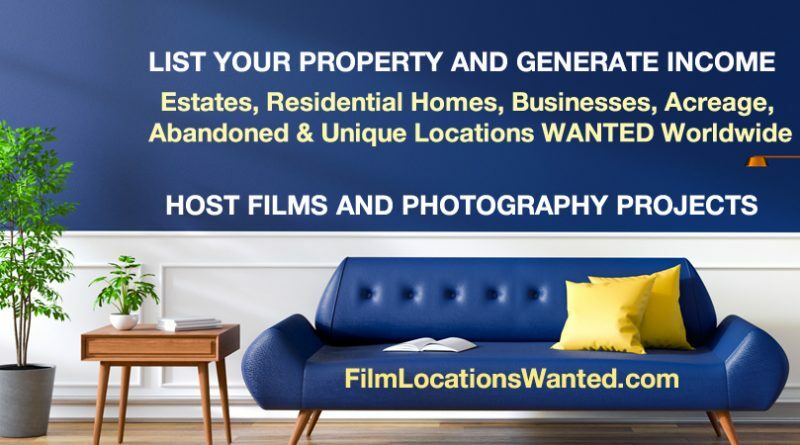 If you are thinking of generating income for your property, consider listing it as a film friendly location. Any type of property is a potential film location. When watching films, television commercials or photography, pay special attention to the locations used in the scene. For one film there can be hundreds of locations used. A home, businesses, outdoor locations and much more are generally used during the production of a film. It does not matter the condition of your property, what matters is if it will fit for the scene being shot. A production company may want to use only one room or space on your property, to the entire location. It just depends on the script. Many of our film friendly owners offer their property for production and make extra income, and they are located all over the planet. From castles to old abandoned buildings are listed for production crew to review for their projects. If you want to know how to list your home for television commercials, read more details. It is easy to list your property. If you have questions or need assistance on how to list your property for production, contact us. See you in the movies.